After running the San Diego Rock ‘n Roll Marathon in 2012, I was curious if there was a marathon in Tijuana. Sure enough, 2012 was the second time they were running the Tijuana marathon. I wasn’t up for running these two back to back, so I had it on my mind to run it next year. Not ready for a marathon just yet but I will definitly run the half marathon. Nice! I’ll send you an email when it gets closer if you want to meet up before the race. Thanks for this info! Really helpful! I’m looking to run it in 2013 too but don’t know much at all about the area. I’m from the Texas/Oklahoma area and I hear our border works a little different. But could you please email me any links or information on this year’s race that you know of? Such as if the course is going to be the same? I’ve never been to the San Diego area either so whatever you would recommend for packet pick up and stuff? 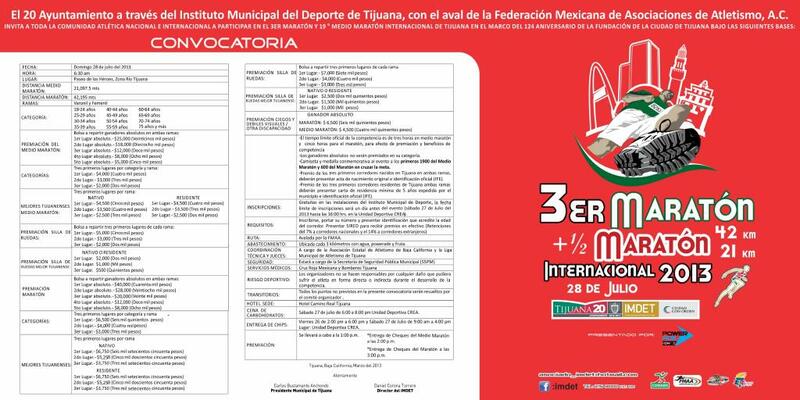 It notes registration and badge pickup location (Unidad Deportiva CREA). 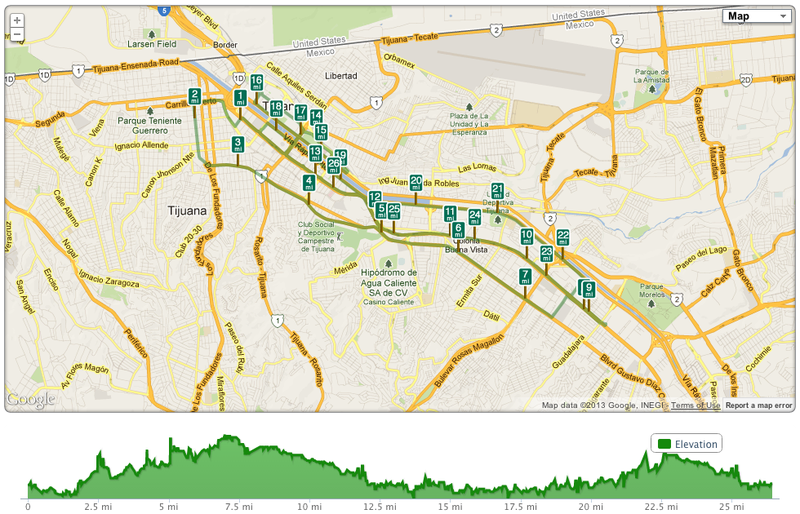 If you have never been to Tijuana, finding your way around could be a challenge. I would suggest asking a taxi to take you there. You can walk across the border in either direction, and take the trolley to and from San Diego. The marathon isn’t really marketed to English speakers, as noted that the only race info is in Spanish. You’ll have to be ready to speak Spanish and be ready for the unexpected. Tijuana is a great place but you have to be flexible and plan ahead. I’m over in Los Angeles from the UK when this is on and am interested in doing it. I’m about two hours from Tijuana so it will need careful planning. From what I can gather (using Google translate) registration is on the Saturday and the race is at 6:30am on the Sunday. Looks like it is about a mile from the border so not sure if I should be trying to park in Tijuana or park in USA and walk or bus across. IT looks like the finish is quite close to the start. Is the event still open for registration? Do they have a 10k or 5k option? Chris, the links above take you to an online registration form. You then pick up your badge the day before the race.